What's in it: The notes include black tea, lapsang souchong, orris butter, Kyoto moss, musk balsam, sandalwood & ???. What does it smell like: There is a brief and bright fruity-citrus open. Then, a blend of black tea, not quite as pine-y / smoky as I expected from the lapsang, but a little pine-y / smoky to be sure (if you want more smoke, get City on Fire; if you want more pine, try Cape Heartache). Plus, iris, and plenty of it — to my mind, this is an iris fragrance first and foremost. The iris starts out fairly vegetal, and works its way closer to cosmetic powder as O, Unknown settles. The base is warm, earthy, chalky-creamy, woody and lightly sweet, and made me think of vanilla and heliotrope, with a dash of concrete. It's unisex and the lasting power is good. Verdict: I'm a sucker for a decent, offbeat-but-wearable iris, and perhaps a sucker for Imaginary Authors as well — I like the quirky packaging, I like the tongue-in-cheek novel names, and I like the reasonable prices. This one will make my buy list. Figures that I just missed a sale on the 14 ml travel sizes (they were 15% off last week), but I'll wait for the next one. I want a small bottle of Memoirs of a Trespasser, too. In case you want some too: I have a 14 ml travel size of O, Unknown! to give away. It has been used lightly for testing. I will send it anywhere in the world, but the usual giveaway rules apply — I will take eons to mail, and I won't be responsible if something goes wrong in the sending. If you want it, comment below, and start your comment with "I want it." I will pick a winner using my handy dandy random winner app next Friday, and I'll announce the winner on Monday, 27 November. 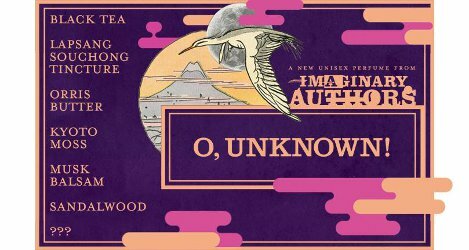 The details: Imaginary Authors O, Unknown! is available in 14 ($38) or 50 ($95) ml Eau de Parfum. 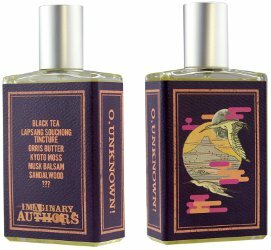 For buying information, see the listing for Imaginary Authors under Perfume Houses. And the one before this with the angel on the bottle that I’m too lazy to research the name of. (Mrs. Schatzel is shaking her head at that sentence! LOLOLOL) ???? I want it! I’m a sucker for quirky tea fragrances. Plus I’ve never tried Imaginary Authors. The usual applies…I live in the US and you can use my email to contact me. Thanks! There really should be more quirky tea fragrances — not sure this one qualifies for me, though. Thanks for the review Robin! I’d love to sniff O, Unknown! but I’m still too intimidated by iris to want the bottle. It sounds like it’ll go to a good home though! This is probably not a starter iris? If Prada Infusion d’Iris is too much for you, this one would make you queasy. I would love to be the winner. I’m a big fan of Imaginary Authors especially The Soft Lawn in the summer time. Tennis balls in a fragrance!! Absolutely use my email and I am a resident of the US. Pick me pick me pick me. I want it!! Color my face red. My first giveaway entry and I got over excited. ???? Just to make sure I covered the bases I am in the US and you can happily use my email. I want it. I mean weirdo iris+tea+a little smoke? I want it. Curiosity has gotten the best of me, as usual, with most things scent-related. As always, thanks for all the giveaways! I have in fact wanted it since I saw the notes list – glad to hear you like it, Robin. I want it! I am a crazy iris lover and it is really good that you mention there is plenty of it in this perfume. I never get tired of new iris findings. Thanks a lot for the giveaway Robin. I am in the US and you can use my email. I want it! I am interested in buying a few of these travel sizes- several appeal to me, but I have been behaving myself. Thanks Robin. I am sorely tempted by everything from this brand, but this one takes the cake. I love tea and iris. That travel spray may be too good a deal to pick up. I want it. Thanks for the review and contest. I’m just now exploring iris fragrances. Fwiw, I’ve seen a few reviews of this on YouTube, and your review is the only one that actually is comprehensive and helpful! I also want it! I’ve always wanted to try an Imaginary Authors fragrance. I live in the U.S. and you can use my email etc. Thanks for the draw! I want it. I love iris and tea and smoke Thank you for the giveaway, I am in the US and you can email me. I want it. I love iris in all her permutations. I live in the USA, and you can contact me via my e-mail address. I want it. I’m an iris fan, for sure. I live in the US and you may use my email. Thank you for the giveaway! I want it. Thanks for these giveaways, Robin. I live in the US and you may use my email. I want it…I’m bummed as well about missing the 15% off sale. MOAT is on my list and I’ve also been digging a Saint Julep sample I have. I love iris, and I would love to try it. Thank you! I can’t have enough irises, each one is a delight to me. I haven’t tried any Imaginary Authors yet. I want it. My feelings on Imaginary Authors are the same as yours, Robin, and I’ve wanted to try this one since I first read the release, a new iris scent sounds good. Thanks for the review and giveaway! Did someone say Iris!!! I have not explored The Imaginary authors much. I want it. You make it sound eminently wantable. I haven’t tried a lot from Imaginary Authors. Lapsang + iris sounds like a fun combo, and I need more iris in my collection. I really enjoy Imaginary Authors. I’m on my second bottle of A City on Fire and adore Cape Heartache as well. I’ve contemplated buying Memoirs of a Trespasser too. Unfortunately, iris is not for me. Glad to see another fan! Because I like free things. Also, lovely review, as usual! I want it, want it, want! Will it count as three entries?)) I’ve never had a chance to try anything by IA and am a sucker for iris as well. I live in Europe and you may use my mail. Thank you, Robin. I want it. Love iris (although not so sure about the smoke). I want it. You had me at iris. I am in the U.S. and okay to use my email. You said you’d ship anywhere, so it probably doesn’t matter that I live in the US. This giveaway seems to have uncovered a horde of Iris fiends. Happy to be one of them! I want it! I have a US mailing address. I received a sample of this for my birthday, and it’s terrific. Darn it, I missed the sale too. I love that they offer travel sizes and I wish more niche lines did. Thanks for the draw and the review!!! but mostly i want to read the book it was inspired by. who will write it? I want it. I haven’t paid any attention to this line, but now, lemming-like, must have. Thanks for your edifying review and offer. You may use my email. I want it! It’s definitely on my list. Although I would love to have the tea element come through more strongly. I really enjoy my travel-size Memoirs of a Trespasser. Thanks for the giveaway! I want it! Iris and smoky tea sounds delicious! I too am a sucker for Imaginary Author and any iris really is my kind of iris! I want it. Anything on your buy list has to be good! I want it! I don’t like the IA stories, but I do like their scents. Iris and tea sound wonderful right now. Thanks! Have I really not tried any Imaginary Authors? This concept, art, bottle size and wearable-but-quirkiness is right up my alley. Plus it’s IRIS and on your buy list!!! I need to check out their sample program. My favorite wearable but quirky iris centric frag is the Penhalligon ballet slipped one. That one is brilliant. I want it. – And I already had the opportunity to sample it, for me it’s close to Iris Nazarena, but sharper and more masculine. Which is good! tea, smoke, iris? sounds made for me. I am so curious about “Kyoto moss” too! I want it! The notes sound really interesting. I have a traveler size of Memoirs of a Trespasser and I think its really well done. I would love to try the new one. Thanks for the giveaway, Robin. Complex iris is the only way I have to appreciate Iris. As I mentioned before, my friend ordered the entire line and I have two favorites, they are all lovely, that have become a part of my signature fragrance roation. I’ll give this one a sniff tomorrow! I want it! Sounds very interesting. I love Cape Heartache. I want it! I’m finally catching up on some reviews for the last week. Once I get through my decants of Violet Disguise and Memoirs I’ll have to see about travel sizes. I would love to win this! Tea and iris really sounds like what I’m into!